Europe is a great place to explore for solo surfers as well as families looking to escape the cold northern European winters and head south for some sun. Europe is home to some quality world-class waves! From the big winter waves in Ireland to the barrelling beach breaks of Hossegor, from magical Mundaka to Supertubes in Portugal, The Canary Islands and Madeira, there are all sorts of different waves for all sorts of surfer. The diversity of the cultures, languages and people make Europe such an interesting destination for surfers looking for a cultural surfing experience. Each country in Europe is so exciting, the people are so different and each region and country boasts fine wines and cuisine as well as long coastlines full of waves. France has some of the best beachbreaks in Europe, Hossegor is a great place to improve your skills and there are spots for the learners to get up and riding too. Fly into Biarritz, which is a romantic, Basque beachside town with beautiful boutique-style shops, lovely restaurants and boardered by the rugged coastline, all lit up at night. Just over the boarder in The Spanish Basque Country is the magical village of Mundaka. It’s a good idea to hire a car or to fly to Bilbao. An amazing village overlooking an amazing left-hander – experienced surfers only here but learners can take lessons from the Mundaka Surf Shop. The little beachtown of Loredo is further along the coast towards Santander. The beaches have some good fun waves, amazing scenery all around, nice and easy place to learn to surf and also spots that hold the bigger, winter swells. Portugal is just a 2.5 hour flight from the UK and is a great spot to enjoy some blue skies and fun waves all year around. The south of Portugal is called The Algarve, great destination for those who want sun and easily accessible, mellow waves in the summertime to learn to surf or improve your skills. There are easy point-breaks and beautiful beachbreaks which are surrounded by the tall cliffs, sheltering the waves from the wind. The Canary Islands are only a 3 hour flight from Spain and they are like the Hawaii of Europe. Warm climate all year round and great waves everywhere. The Canaries are quite localised but if you show respect and cruise around, you’ll find some quiet waves somewhere. Lanzarote, Fuerteventura, Gran Canaria and Tenerife are the main surf spots, all having amazing waves and passionate locals. 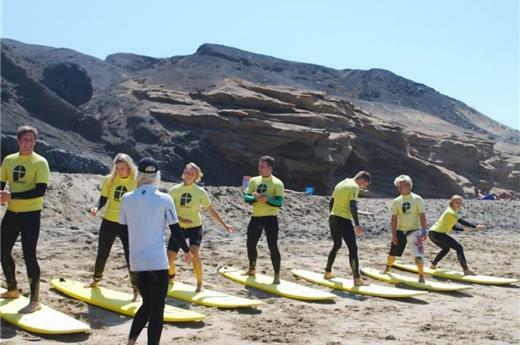 The surf season runs from October through March with November to February considered as the prime months. Summers are generally flat, with few breaks able to make much of locally generated windswells on the east coast or Atlantic hurricane swells that tend to sweep further north. Madeira is an island just off the coast of Portugal and Morocco and is a big wave spot, relatively inconsistent but beautiful scenery and great food. The UK has some great waves and keen surfers as the best swells hit the British Isles and Ireland in the wintertime (September – April). For those living in London and wanting to get to a surf spot close by, check out the Bundoran Surf Company. Hossegor, France is the capital of surfing in Europe! Napolean diverted the Ardour River from Hossegor to Bayonne, leaving it with a super deep trench bringing the power of the Atlantic Ocean into the Bay of Biscay to form perfect waves on the shores of Hossegor. Breaks like The Graviere, La Nord and La Piste are the spots for deep, thick spitting barrells, not for the faint-hearted but very manageable on a small summer swell. No sharks, no reef, just beach breaks from Hossegor up to Lacanau. Depending on your budget and level of surfing we can suggest the best country and the best option for your European Surf Trip. Whether you want to party in Hossegor during the World Championships or chill out in 5* Family Beach Resort in the Algarve, there is something to suit everyone. Three & four Star hotels – for those wanting a bit of luxury but reasonable prices – Hotel Maison du Lierre in Biarritz is a great spot, in the centre of town but 300metres from the beach. The Bahia Real in Fuerteventura is the ultimate in luxury, overlooking the island of Los Lobos. Visit the Gugenheim museum in Bilbao or do some wine tasting in the vineyards of France, eat tapas in San Sebastian or go snowboarding in the Pyranees. There are festivals happening all over Europe in the summer months so check them out when you’re not surfing. May until October is the main surf season in southern France, Spain and Portugal and the summer months of July and August are the hottest and least consistent months. Big swells roll across the Atlantic Ocean into the Bay of Biscay sending consistent swell all over Europe in the winter months from November to March. France is one of the most popular spots in Europe for it’s beaches and waves in summer. There’s so much culture, good wines and fun nightlife especially when the world championship surfing contest comes to town in the autumn. The Northern coast of Spain likes the southerlys for the off-shores but there are so many coves and hidden bays, you can always find a sheltered spot. Portugal picks up north, west and south swells, which means pretty consistent surf. The weather is mild in winter and warm in summer and the water is cooler, although it’s further south, the gulf stream cools down the water so a wetsuit is necessary for most of the year except summer.